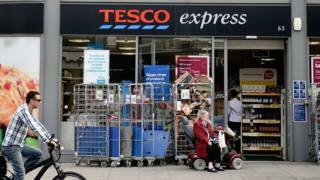 Tesco plans to replace 1,700 deputy managers in its chain of Express convenience stores. Their work will be taken by an extra 3,300 lower paid "shift leaders", increasing staff numbers by 1,600. The retailer said the deputy managers would be offered the new roles, redundancy payments or be redeployed. It comes on top of 1,000 job cuts announced by Tesco in January as part of a plan to cut the number of its distribution centres. Tracey Clements, managing director of convenience stores at Tesco, said: "To help improve our service to customers in our Express stores we are aiming to have more of our colleagues on the shop floor, more often. "We appreciate that these changes will impact our deputy manager colleagues, and will do everything we can to support them throughout this period." In recent years, the UK's big four supermarket groups have faced stiff competition from smaller rivals such as Aldi and Lidl. This, combined with decreasing demand for weekly shops at large out-of-town stores, has forced them to revise their plans for expansion. Some poorly performing stores have been closed, while plans for new outlets have been abandoned. Earlier this month, Waitrose said it would shut six supermarkets and also remove a layer of management, cutting 700 jobs in the process, along with the removal of 180 department manager posts in its 350 stores. The latest sales figures from Tesco showed that in the six weeks to 7 January, which covers the key Christmas period, like-for-like sales rose 0.7% in the UK. Last month, Tesco announced it had agreed to buy the food wholesale group Booker for £3.7bn.